A new study shows that the breakdown of water molecules trapped in ancient Martian rocks likely produced enough chemical energy to sustain microorganisms for hundreds of millions of years beneath the Red Planet’s surface. PROVIDENCE, R.I. [Brown University] — A new study shows evidence that ancient Mars probably had an ample supply of chemical energy for microbes to thrive underground. Earth is home to what are known as subsurface lithotrophic microbial ecosystems — SliMEs for short. Lacking energy from sunlight, these subterranean microbes often get their energy by peeling electrons off of molecules in their surrounding environments. Dissolved molecular hydrogen is a great electron donor and is known to fuel SLiMEs on Earth. This new study shows that radiolysis, a process through which radiation breaks water molecules into their constituent hydrogen and oxygen parts, would have created plenty of hydrogen in the ancient Martian subsurface. The researchers estimate that hydrogen concentrations in the crust around 4 billion years ago would have been in the range of concentrations that sustain plentiful microbes on Earth today. The findings don’t mean that life definitely existed on ancient Mars, but they do suggest that if life did indeed get started, the Martian subsurface had the key ingredients to support it for hundreds of millions of years. The work also has implications for future Mars exploration, suggesting that areas where the ancient subsurface is exposed might be good places to look for evidence of past life. Since the discovery decades ago of ancient river channels and lake beds on Mars, scientists have been tantalized by the possibility that the Red Planet may once have hosted life. But while evidence of past water activity is unmistakable, it’s not clear for how much of Martian history water actually flowed. State-of-the-art climate models for early Mars produce temperatures that rarely peak above freezing, which suggests that the planet’s early wet periods may have been fleeting events. That’s not the best scenario for sustaining life at the surface over the long term, and it has some scientists thinking that the subsurface might be a better bet for past Martian life. The researchers looked at data from the gamma ray spectrometer that flies aboard NASA’s Mars Odyssey spacecraft. 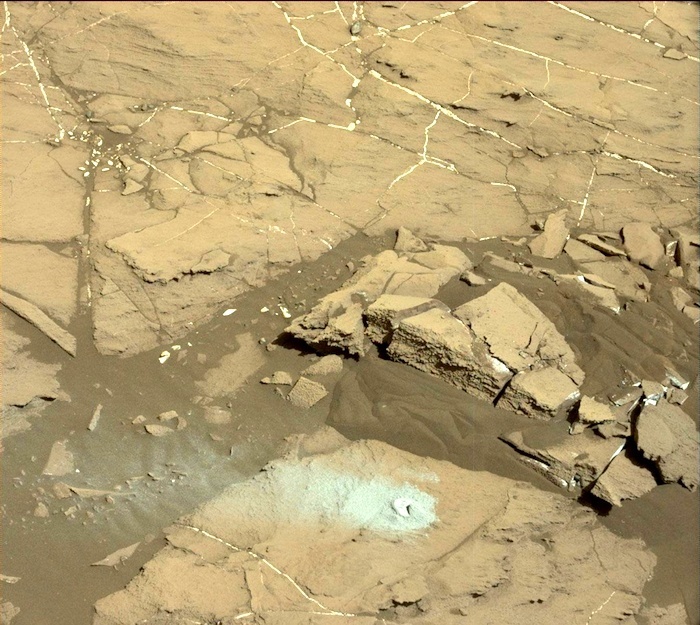 They mapped out abundances of the radioactive elements thorium and potassium in the Martian crust. Based on those abundances, they could infer the abundance of a third radioactive element, uranium. The decay of those three elements provides the radiation that drives the radiolytic breakdown of water. And because the elements decay at constant rates, the researchers could use the modern abundances to calculate the abundances 4 billion years ago. That gave the team an idea of the radiation flux that would have been active to drive radiolysis. The next step was to estimate how much water would have been available for that radiation to zap. Geological evidence suggests there would have been plenty of groundwater bubbling about in the porous rocks of the ancient Martian crust. The researchers used measurements of the density of the Martian crust to estimate roughly how much pore space would have been available for water to fill. Finally, the team used geothermal and climate models to determine where the sweet spot for potential life would have been. It can’t be so cold that all water is frozen, but it also can’t be overcooked by heat from the planet’s molten core. Combining those analyses, the researchers conclude that Mars likely had a global subsurface habitable zone several kilometers in thickness. In that zone, hydrogen production via radiolysis would have generated more than enough chemical energy to support microbial life, based on what’s known about such communities on Earth. And that zone would have persisted for hundreds of millions of years, the researchers conclude. The findings held up even when the researchers modeled a variety of different climate scenarios — some on the warmer side, others on the colder side. Interestingly, Tarnas says, the amount of subsurface hydrogen available for energy actually goes up under the extremely cold climate scenarios. That’s because a thicker layer of ice above the habitable zone serves as a lid that helps to keep hydrogen from escaping the subsurface. Tarnas and Mustard say the findings could be useful in thinking about where to send spacecraft looking for signs of past Martian life. Mustard, who has been active in the process of selecting a landing site for NASA’s Mars 2020 rover, says that these kinds of breccia blocks are present in at least two of the sites NASA is considering: Northeast Syrtis Major and Midway. Other coauthors on the paper were Barbara Sherwood Lollar, Mike Bramble, Kevin Cannon, Ashley Palumbo and Ana-Catalina Plesa. The research was supported by the Mars Data Analysis Program (MDAP) (grant 522723), the Natural Sciences and Engineering Research Council of Canada (grant 494812) and a Brown University graduate fellowship.